My mom said if it's meant to be then it's meant to be. While I believe that, I question how much control I have over the situation. After almost four weeks of waiting, I finally heard back from HR this weekend regarding the position I interviewed for late last month in Seattle. I will keep looking and applying though. On the bright side, I have a couple interviews here in Chicago so that's something. 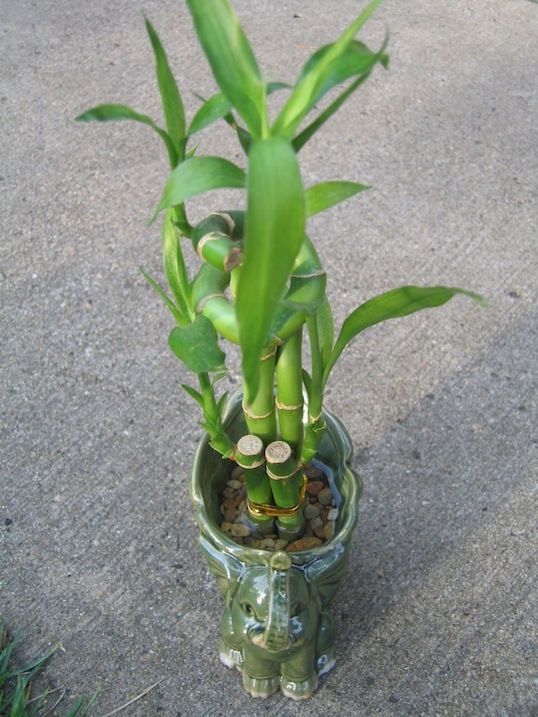 One of my student workers at my university job gave me this lucky bamboo plant for good luck with the potential jobs. Yet I can't help but wonder if I should become further ingrained in my home city and just let the dream die. Of starting over somewhere new. Perhaps it's not meant to be. Well, it's too bad you didn't get the job in Seattle. But I'm reminded of the deacon at the nearby parish who told one morning of praying to get a certain position at Proctor and Gamble in Cincinnati. He got the job, and it turned out to be a terrible position, largely because of a bad boss. So, you just never know. As for getting a better job in Chicago — it doesn't have to kill the dream of Seattle. A better job is just a better job. It will only kill the dream of Seattle if it's good enough to satisfy you at the level Seattle would. While you would probably appreciate its climate, I doubt Seattle would make you any more free or happy. The grass often appears to be greener on the other side of the hill. I'm sorry to hear that you didn't get the job in Seattle, but don't give up hope! After learning so much about you while working together, I know that Seattle is the place for you! Maybe you'll get the one at the university over there. Keep trying. You can make it happen! I'm glad you like the lucky bamboo. I know it's not much, but hopefully the luck starts soon. Maybe you'll get a full-time job here in Chicago. Then you can save up money and gain even more experience! And let's say you don't end up living in Seattle... Getting a full-time job means more money to save up for vacations! Woohoo! Yeah, I know the Seattle job would've been very demanding and stressful but thought the chance to be elsewhere and the high pay would compensate for that. Wise words from you, sir! Perhaps, but the weather in Seattle would recharge me when I need it most. Here in the Chicago, the heat, sun, and humidity do just the opposite. I agree, getting something full-time here in Chicago will allow me to save up more money. Seattle isn't going anywhere anytime soon and I can always try getting out there in the months ahead. I miss working with you already! Every door is just a door. One closes, turn to the open ones. I have been so caught up in work that I haven't made the time for some things that are more important. forgive me, please. I thing this gift from your friend Theresa is a gift to me, too. May my desire for your success find some odd or improbable way to sustain you in your times of doubt and isolation, too. I'm reaching for every open door I can, Randy! Sometimes it takes a leap of faith. I moved to Arizona because I had lost my job in Downers Grove and it ended up propelling me to my future. Don't give up the dream, just let time figure out how to make it happen. Your story gives me hope! I'll give it some time yet. I don't think I've commented here before, though I have been following your blog for quite a while. I don't know whether your dream is meant to be, but I'm sure of one thing: the best way to let your dream die is to give up on it - to stop looking for the job you want, in the city you want. You deserve to be happy, so I would urge you to keep looking. Best of luck! I'm always looking, Mark. Always! I appreciate you commenting here, sir!